Anglo group tells Netanyahu a U.S. Attorney General would never block president's policy the way Israel's does. 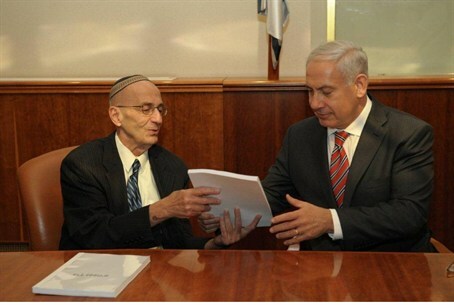 In a letter addressed to Prime Minister Binyamin Netanyahu, Likud Anglos’ Executive Director Daniel Tauber rejected the delay on the discussion of Levy Report due to reservations expressed by Attorney General and Legal Advisor to the Government, Yehuda Weinstein. Tauber expressed support for Netanyahu’s initial decision to raise the Levy Report for discussion and approval in the Cabinet, and said it not Weinstein’s place to obstruct the government’s adoption of the Levy Report’s conclusions. “The state’s legal establishment must understand that democracy is not just a mechanism to advance the establishment of a Palestinian state and the destruction of settlements in Judea and Samaria. The public may choose a new path – and reject the path of Disengagement and Oslo – as it chose in the last elections, when the Likud was elected to lead the state,” the letter said. “You are the one who was elected by the Jewish people to decide and not Weinstein. It is not appropriate to indefinitely delay the discussion of report due to Weinstein’s opposition.” Tauber argued that while Weinstein may claim the current government is a “transitional government,” elections are not being forced by a motion of no-confidence or prime-ministerial resignation, but by governmental request. Therefore, “This government is legitimate and will remain legitimate until the elections and the formation of a new government,” the letter said. The letter also argued that adopting the Levy Report was necessary to prove that the Likud still stood by its principles, which include protecting ‘the integrity of the homeland” and striving to develop “all” of the Land of Israel. “The Likud is not Kadima – a party born of betrayal of those principles,” it said. Tauber also applauded steps taken by the Likud party leader to prevent members of the Kadima party from retaining internal Likud voting rights.